Nicola Sturgeon has dismissed claims that her officials interfered in plans for a controversial Highland golf course – amid warnings they risked repeating mistakes made during Donald Trump’s Aberdeenshire application. The first minister was quizzed in Holyrood on the proposals for Coul Links in Sutherland. Highland Green MSP John Finnie highlighted evidence that the developers had held “many meetings” with the Scottish Government, including the Rural Economy Secretary Fergus Ewing. Mr Finnie said: “When Donald Trump built his course in Aberdeenshire, we were told that it would improve the environment. The site there is now in danger of de-designation. 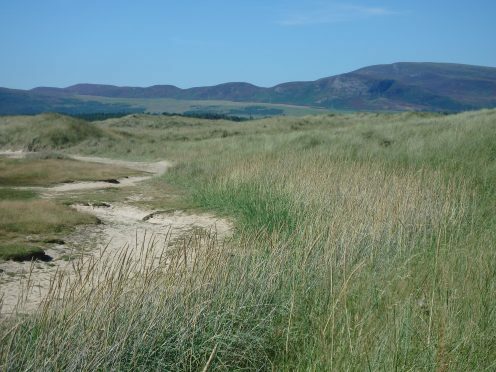 “Similar environmental improvement claims have been made about Coul Links. Does the first minister not see that history is repeating itself? US businessman Todd Warnock and world renowned golf course developer Mike Keiser are spearheading the proposals for the 18-hole course near Embo. A petition against the scheme has been signed by almost 90,000 people – more than six times the population of Sutherland – with part of the land on a Site of Special Scientific Interest. Ms Sturgeon rubbished the accusations of interference at first minister’s questions, however. The SNP leader said: “This is a live planning case and the planning application is currently being considered by Highland Council. “It is important to note that no meetings with Scottish Government ministers or officials have taken place since the planning application was made. “However, of course government engages with companies that are proposing planning developments, and the suggestion that we should never do that before planning applications are made is a ridiculous one. “We regularly engage to try to encourage companies to invest in Scotland, but I add that part of the reason for the engagement is to help people who are proposing major developments to understand the strict planning rules that they must then adhere to. “There has been such engagement in a range of developments—from the Lochaber smelter to Aberdeen harbour and Inverness castle, for example—but I stress that it took place before the planning applications were lodged.